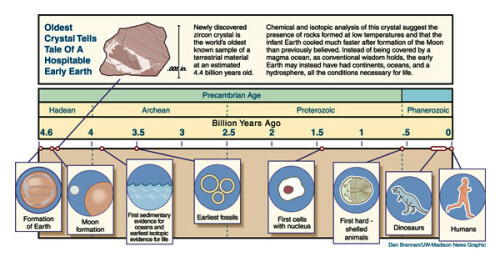 The Origins of Life on Earth is a topic that has an impressive resonance. It comes from an innate human desire to belong: almost everyone wonders where they came from. Anyone who has been to a Natural History Museum, and many who have not, wonder what the world must have been like when the dinosaurs were around. Almost everyone fortunate enough to have had a decent science teacher will have been put in the way of wondering what life was like before any kind of multi-celled organism. Geologists and palaeontologists have pieced together evidence from their respective fields to give a time line of the Earth’s history (Figure 1). In the 1950s, two biological chemists took this curiosity a step further. Stanley Miller and Harold Urey tested the understanding of the early Earth by recreating the molecular components and conditions of the period, in the lab. 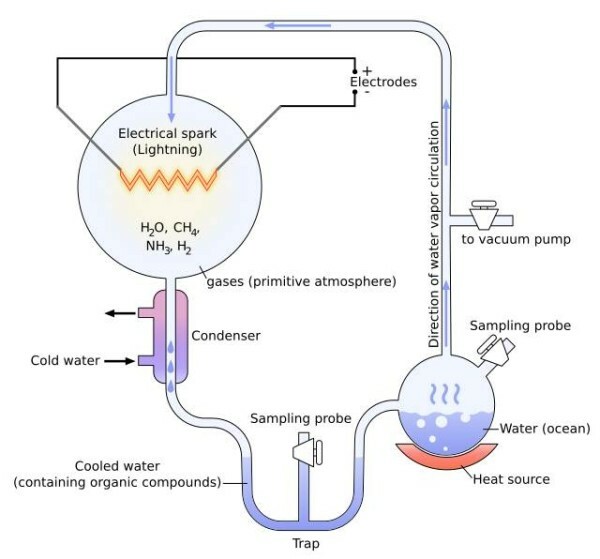 They put ammonia, water, methane and hydrogen in a flask and simulated the conditions of an electrical storm (one with lightning) for a week [1, 2] (Figure 2). What they found amazed them. One thing was amino acids—the monomers that comprise proteins, the machinery of cells. The second, a bit further downstream, was evidence for ribose sugars. These are the precursors for nucleic acids, the basic units of the blueprints of life, RNA and DNA. At a stroke, there was evidence for prebiotic synthesis of two of the principal molecular species of terrestrial living systems. Figure 2. The equipment set-up used by Miller and Urey to explore the chemistry of the early Earth’s atmosphere. It was with this that they showed that amino acids and perhaps riboses could form essentially spontaneously under these conditions. Diagram courtesy of Wiki commons, drawing credit here. A subtle conclusion to this striking result is that the chemistry that drove the production of some of the basic molecular units of life is so simple that in terrestrial terms, it happens spontaneously. This provides an attractive explanation for the how the first batches of two major sets of biomolecules were made. It is not clear whether these spontaneous syntheses happened in rapid succession, as the Miller-Urey experiments suggest, or whether several molecular contributions and variations occurred over years or even millennia. What is clear is that stocks of these molecules could have built up well before they became part of living organisms—there was no ‘Frankenstein moment’ when life was suddenly conferred to a pool of chemicals on the Earth. It is not a huge step of imagination from the riboses and simple amino acids we understand may have existed in this period, to the blueprints and machinery of the cells of which we too are made. What is missing from these experiments is the emergence of the boundary species, the molecular component(s) that separated the cell from its surroundings. What we have yet to pin down is the origin of lipids. The emergence of lipids has a particular importance in the origins of life. Without such molecular species, it is not possible to construct even the most basic form of cell as we know it. The simplest requirement of a cell, alongside it being able to replicate, is that it can manage its internal environment. In fact, if it cannot control its internal environment, in practice, it cannot reproduce. An indispensable part of this is the barrier between the inside and the outside—in our cells, the lipid bilayer. Thus, lipids are required in order for cells as we know them to exist. This need to explain the preparation of the earliest lipids presents several immediate problems in explaining how life as we know it got going. The theory and evidence we have is quite convincing from single cells up to mammals (any decent biology text book above a certain level will explain this lucidly), and the Miller-Urey experiments [1,2] give a significant insight into where amino acids and perhaps nucleic acid polymers came from. Work over the last decade shows that the genetics behind early cells is becoming clearer [3,4], indicating that some of the replication machinery of early cells is being better understood. But how do we get from the early Earth’s atmosphere and weather, to molecules that can spontaneously self-assemble into a primitive membrane that allows cells to divide? Moreover, how can this happen as spontaneously as amino acids form when lightning strikes the ammonia-methane-water-hydrogen cocktail? A recent paper by Patel et al. begins to provide a possible answer . They show that compounds such as prussic acid (hydrogen cyanide), in the presence of copper ions and hydrogen sulfide (also known as hydrogen sulphide, understood to have been released by volcanic activity early on in the Earth’s existence), can form precursors for nucleic acids, amino acids and, importantly, lipids. The crucial part of the spontaneous formation of lipids is how polymers of methane the order of 16 or 18 carbon atoms formed, with oxidation probably only at one end, and how enough of these formed in close enough physical and chronological proximity to assemble into a bilayer. Sadly, this has yet to be explained; a Miller-Urey type experiment that results in fatty acids or anything similar, has yet to be reported*. It is an experiment that many lipid chemists and lipid biologists would give a great deal to stumble upon. What I predict as a more likely progress to the answer is a meeting in the middle. Several experiments have shown that self-assemblies of simple fatty acids are sufficient to provide a boundary for RNA replication . Such experiments have the potential to inform us about some of the limits of what is required for this to take place, e.g. What the shortest length of fatty acid is required for such a boundary, or whether or not fatty acids with oxygen or nitrogen functionality in the middle or at both termini (such as in archaea) are more energetically favoured. At the other end, the design of compartmentalised systems in which conditions such as pH may be controlled  tells us the minimum requirements for basic homeostasis. The (proto-)fatty acids that fall into both categories, ones that are easily made spontaneously and ones that can make a boundary, are prime candidates for being called the first lipids. *I hardly need tell you that if I had a shed, I would be doing this sort of experiment in it. S. L. Miller, H. C. Urey, Science, 1953, 117, 528–9. DOI:10.1126/science.117.3046.528. S. L. Miller, H. C. Urey, Science, 1959, 130, 245–51. DOI:10.1126/science.130.3370.245.